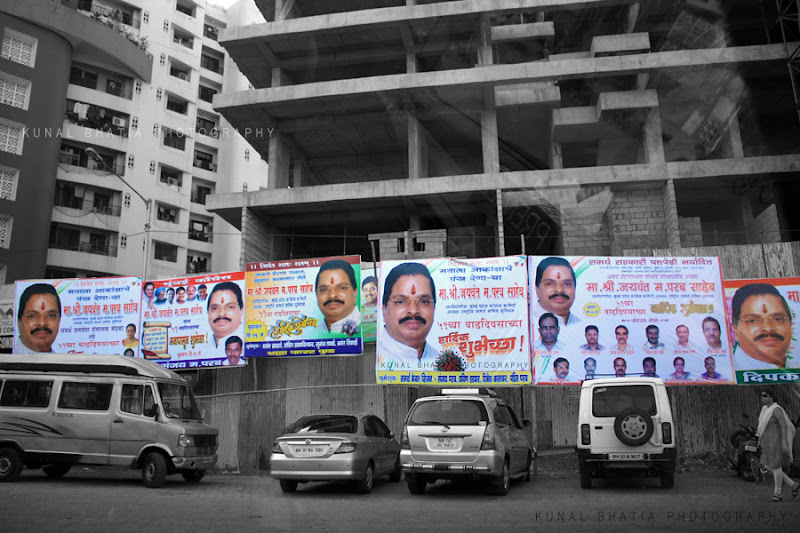 political hoardings seem to be the most prominent signage in the cityscape. here, not one nor two nor three, but over half a dozen birthday wishes line an entire stretch of an interior road in dn nagar, andheri. perhaps the arrogant worm's happy birthday song would be the perfect accompaniment. Is there any significance that all the vehicles are in silver. This digital printing on vinyl has been a curse! A Lincoln: Silver is the most popular colour on Indian roads because the dents and scratches don't stand out and it's easy to tinker, paint over. Thanks for visiting my blog. After looking through your I will came back often. I like your photographs and your comments. You show me a part of a world I have never seen.